ThePlanetsToday.com brings you face to face with the solar system as it is now... and also how it was and how it will be. Where is Halley's Comet (or 67P/Churyumov–Gerasimenko?... and a few others) right now? This page shows the current location of some of the brightest comets. Some of these may even be visible to the naked eye. The data is mostly from NASA's JPL website. 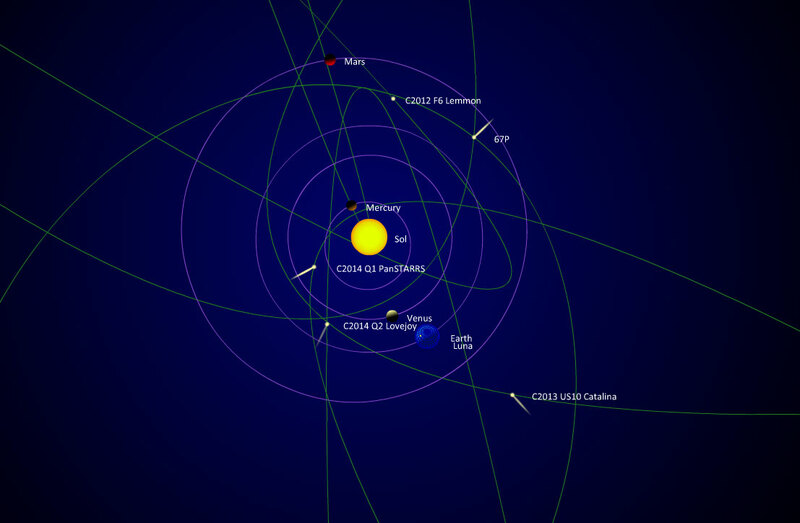 The animation can be run forwards and backwards to show previous and future locations of the comets within their orbits. Before you start jumping up and down and saying - "Hey... that ain’t right! I see no comets there! ", make sure that you have the "3D" view enabled. To explain: Up to now this website has only shown planets and objects which for the most part live in the plane of the ecliptic - e.g. the flat plane that all the planets move around in. Comets, however, do not obey this rule and have orbits that are at quite an angle to the ecliptic. This means that they often come at the Sun from a steep dive angle. 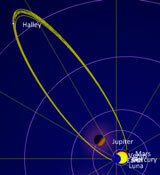 Halley's comet, for instance, at its furthest point from the Sun is about 10 AU (AU = the radius of Earth’s orbit) away from the plane of the ecliptic - on the southern side. Only when it gets very close to the Sun does it pop over onto the northern side for a few months (reaching about 0.2 AU from the plane of the ecliptic) before it goes south again on its way back out of the inner solar system. With the 3D view enabled we show you the distance of any object above or below the plane of the ecliptic by putting it on a "stalk". The view is still really a 2D view but with the stalk providing additional 3rd dimension information. If you want to find the exact location for a comet in the sky, then I recommend using one of the many other useful astronomy sites that can guide you to correct observations. 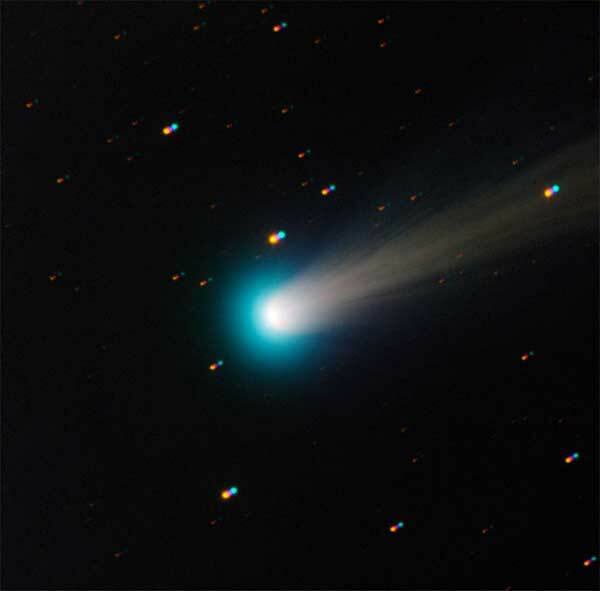 We've shown the comets with tails as they get close to the Sun. This is what really happens of course, but what we've shown is just an estimate and is not (cannot) show what the real tails will look like. Comet tails are produced when the Sun heats up the comet causing volatile materials (such as water) to boil off (or rather sublimate) into space causing a trail of gas molecules to appear. These molecules are pushed by the solar wind and so drift out in a direction directly away from the Sun. Comets also have another tail made of dust that trails the comet in its trajectory (not shown in our animation). The size and intensity of a comet tail, and also the point at which the tail will appear or disappear, cannot be easily predicted. This means that the actual comet tails will differ from that shown in the animation. The real comet tails will also be 3D, where as ours are shown as 2D. Halley's comet is probably the most well known of all the comets. It approaches the Sun every 75-76 years and and its visits may have been recorded as early as 467 BC. It was Edmond Halley who (in 1705) was able to deduce that various historic comet sightings were in fact all of a single comet. He calculated that the comet would reappear in 1758, and when it did indeed return (after Halley's death) this was the first proof that some comets orbit the Sun rather than all being transient objects. The comet was first named in Halley's honour by French astronomer Nicolas Louis de Lacaille in 1759. It has the designation 1P/Halley which means it is the first of the periodic (i.e. orbiting) comets to be identified. The NASA data for comets only covers the years 1600 AD to either 2200 AD or 2500 AD. 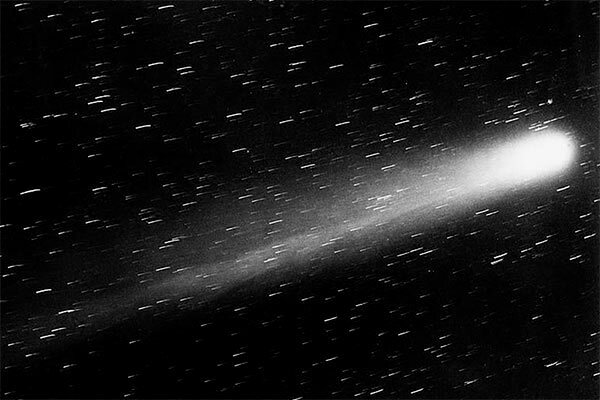 This is because it is difficult to predict accurately the path of comets over any great time. This is due to the fact that the comet is ejecting matter on every flyby of the Sun which means its mass is constantly changing and the ejection of the gasses can act as tiny rocket motors gently pushing the comet off course. Our animation averages out the variations in Halley’s orbit and fills in some of the gaps in the data by using some additional data points as defined on the Halley’s comet wiki page to get approximate fixes for the years 1066 AD and 240 BC. However, the position of the comet shown outside of 1600-2200 is speculative. To see the precise position and the changing orbit of the comet between 1600AD and 2200AD, please visit our Halley's Comet page. As stated earlier, Halley's Comet spends most of its time on the southern side of the plane of the ecliptic and only pops onto the northern side at its closest approach to the Sun. Observation Info. 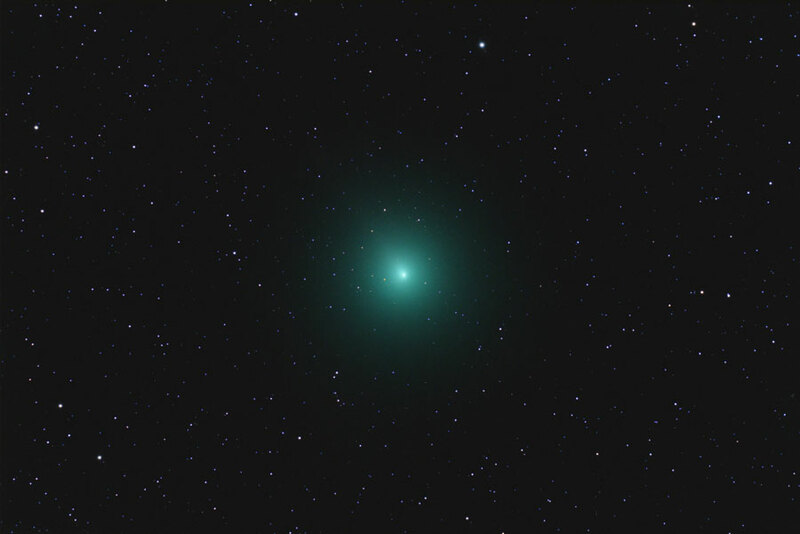 Image of 46P/Wirtanen on 2nd December 2018. Credit: Taken by Mike Broussard on December 2, 2018 @ Perry, Louisiana, USA. By permission of spaceweathergallery.com Link. Taken by Gerald Rhemann on December 7, 2018 @ Farm Tivoli, Namibia, SW-Africa. By permission of spaceweathergallery.com Link. 46P/Wirtanen was discovered photographically on January 17, 1948, by the American astronomer Carl A. Wirtanen. However it took over a year to determine that it was a short period comet. 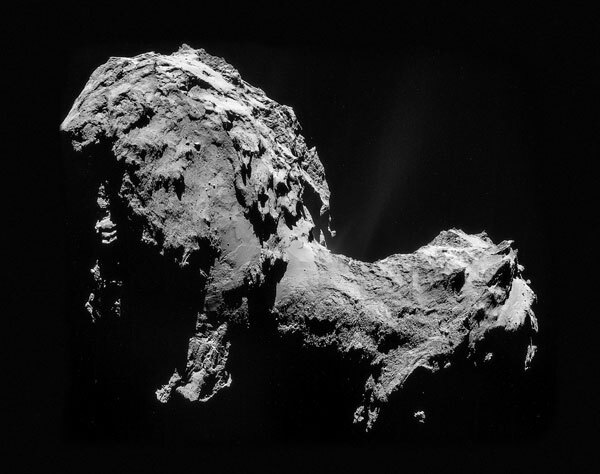 This 1.2 km diameter (approx) comet was very nearly as famous as 67P/Churyumov-Gerasimenko since it was the original target for ESA's Rosetta mission. However they were unable to meet the required launch window and so 67P was chosen instead. The orbit shown in the app on this page is only reasonably accurate for years 2000-2030. This is because 46P's orbit is very unstable. It will change significantly in 2054 when Jupiter will knock it into a very different orbit. To watch the actual trajectory of 46P's orbit from 1600 to 2500, visit our 46P/Wirtanen Orbit page. On 16 December 2018 the comet will pass 0.08 AU (11 million Km) from Earth and should be visible to the Southern hemisphere before, and in the Northern hemisphere after, that date. Observation Info. 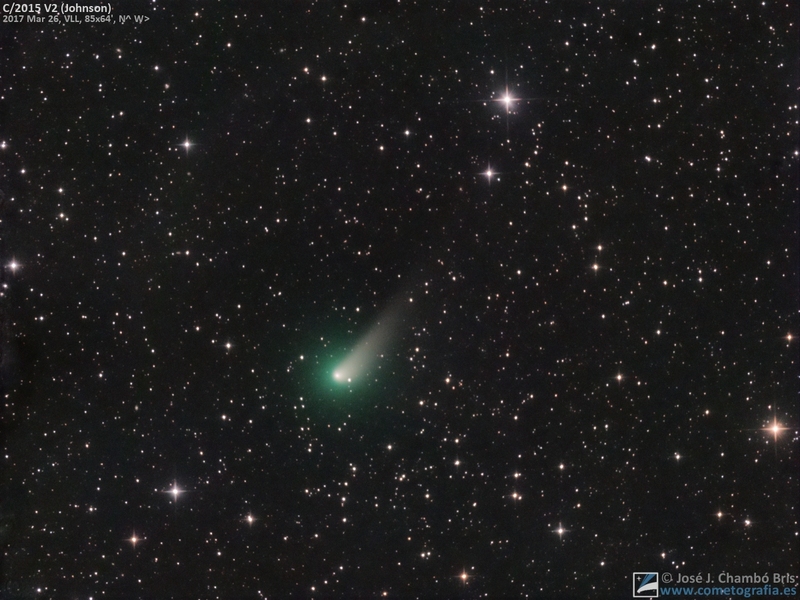 Comet 2P/Encke : Source: Gerald Rhemann. Published: 14 May 2014. Link | This image of comet Encke was taken in Jauerling (lower Austria). The second periodic comet to be discovered - or rather recognised - is 2P/Encke. This comet is in a short 3.2 year (approx) orbit and was first observed in 1786 by Pierre Merchain. After being observed again in 1795 and 1818, Johann Franz Encke was able to link the previous observations and in 1819 successfully predicted the comets return for 1822. This comet, which has a very dark surface and a diameter of around 4.8km, makes close approaches of earth about every 33 years and is thought to be the source of the Taurids meteor showers. It has also been suggested that a fragment of this comet may have been the cause of the Tunguska event of 1908, when a large area of Siberian forest was destroyed by a huge air-burst explosion. Observation Info. This comet (called 41P T-G-K in our app) was first discovered by Horace Parnell Tuttle on May 3, 1858, and re-discovered independently by Michel Giacobini and Lubor Kresák in 1907 and 1951 respectively. It has a period of about 5.4 years and a diameter of about 1.4 km. This comet is of interest as it has been known to flare dramatically. In 1973 the flare was 10 magnitudes brighter than predicted, reaching easy naked-eye visibility (apparent magnitude 4). Flares were also witnessed on 67P by the Rosetta spacecraft and are thought to be the result of landslides exposing a large area of volatile materials to space resulting in an increase in out-gassing. The increased volume of dust and gas reflects more sunlight resulting in a brightening of the comet. Observation Info. This comet (called 45P H-M-P in our app) was discovered by Minoru Honda in December, 1948. It has a period of 5.25 years and a nucleas of between 0.5 and 1.6 km diameter. The comet was binocular visible (~magnitude 7) on its last visit at around February 2017 - viewable in the northern hemisphere. The next notable close approach will be in October 2032 when the comet might brighten to magnitude 7. Observation Info. This comet was discovered in 1969 by Klim Ivanovych Churyumov of Kiev University after examining a photograph taken by Svetlana Ivanovna Gerasimenko. This 4.3km long dumbbell shaped comet is in a short 6.5 year orbit. It currently rotates every 12.4 hours but this rotation is slowing quite rapidly - thought to be due to it losing its ice due to sublimation. NOTE: The orbit shown here is only correct for times after February 1959. In that month the orbit was changed by a close encounter with Jupiter. In the previous orbit 67P came no closer than 400 million km from the Sun and now it moves to within 190 million km. Observation Info. In 2014 the Rosetta spacecraft began orbiting 67P and successfully landed the probe "Philae" on its surface. For more information on Rosetta and the Philae lander- including the full flight path and current position, visit our Rosetta Flight Path page. This comet , accompanied by its sister fragment P/2016 BA14 (PANSTARRS), came within 3.3 million miles (or about 14 lunar distances) from earth on 21st and 22nd of March 2016. The images above are the closest observations of a celestial object Hubble has ever made - other than those of the Moon. The image sequence shows that the comet nucleus is rotating and so that the stream of gas and dust from the comet is also rotating - rather like water from a rotating sprinkler. This comet is less than a mile across and orbits the Sun every 5.3 years. 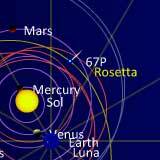 It lies between Earth's and Jupiter's Orbits coming very close to each of these planets from time to time. 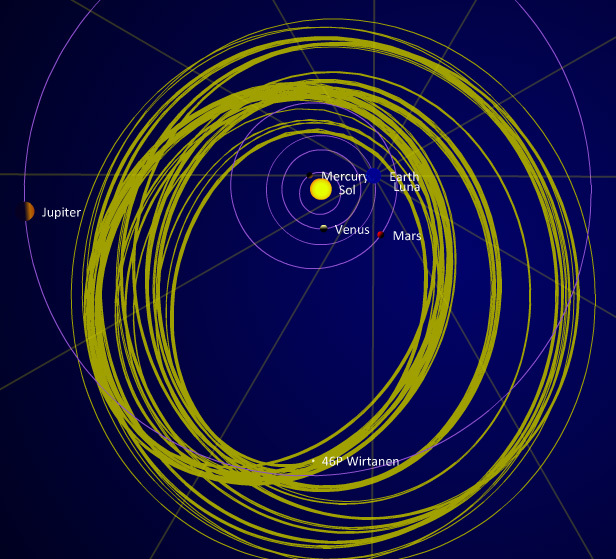 The orbit shown is only correct for years after 1785 since in that year the comet's orbit was changed by an interaction with Jupiter's gravitational field. Before then the comet would not have got closer to the Sun than the asteroid belt. This comet came from deep on the southern side of the ecliptic and popped into the northern side on May 6th 2015 and then looped back, passing into the southern side on July 15th 2015. It has an orbital period greater than 40,000 years. Observation Info. ISON is another comet from the Oort cloud, but unlike C/2014 Q1 (PanSTARRS), ISON is moving so fast in that it will never return to the Sun. ISON has a similar trajectory to panSTARRS in that it enters and exits the inner solar system from the northern side of the ecliptic at an angle of about 30 degrees. It goes onto the southern side of the ecliptic as it loops around the Sun. Another animation in 3D shows this trajectory on the Wiki page. C/2012 F6 Lemmon was detected in 2012 at the Mount Lemmon Survey... hence the name. It also comes in at an angle of around 30 degrees to the north of the ecliptic and leaving at a much steeper angle. This comet has an orbital period of around 8000 years. 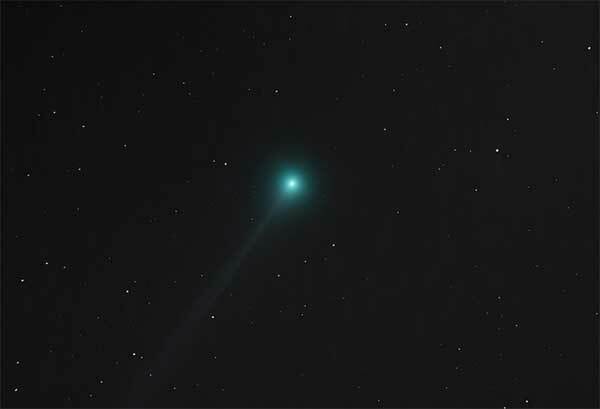 C/2014 Q2 Lovejoy was detected in 2014 by Terry Lovejoy using an 8" telescope - the fifth comet he discovered. This comet crossed into the northern sky on the 9th January 2015. It has an 11,000 year orbit and was best observed in dark skies during early 2015. Observation Info. Chiron was detected in 1977 by Charles T Kowal. It was first thought to be a large asteroid but subsequently has been seen to have properties similar to a comet (i.e. a tail has been detected) and so is designated as asteroid 95P and Comet C/2060. These dual properties gave rise to Chiron being classified as a centaur - a mythical creature with the body of a horse and the upper torso of a human. This classification has come to mean small solar system bodies that orbit between Jupiter and Neptune and also overlap one or more of these outer planet orbits. Its radius is estimated at between 80km and 120km, and rotates once every 6 hours. It orbits the Sun every 50 years and has a slight incline to the ecliptic of under 7 degrees. It is thought to be in an unstable (as measured in a million years) orbit and is therefore thought to be a newcomer to the central solar system from perhaps the Kuiper belt. 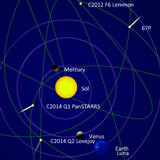 C/2013 US10 Catalina was discovered in 2013 by the Catalina Sky Survey. This object is thought to have been recently knocked out of a several million year orbit in the Oort cloud and is now on an escape trajectory. This comet is moving in a plane that is at 60 degrees to the ecliptic and came hurtling in from the northern side, passing through the ecliptic in Jan 2004. It looped around the Sun and crossed back into the northern hemisphere on 27 November 2015 and is heading off never to return. Observation Info. 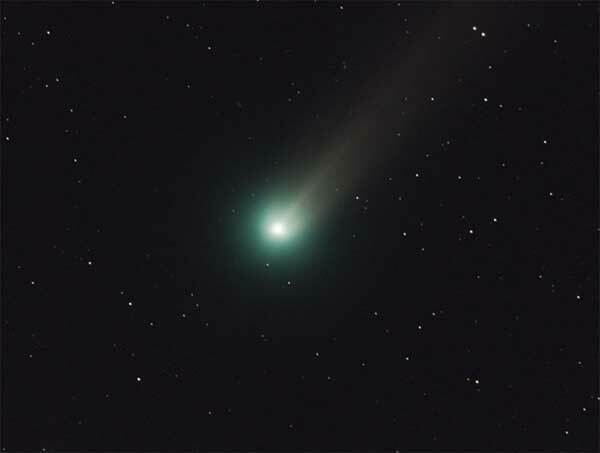 Discovered on 3 November 2015 by Jess Johnson of the Catalina Sky Survey, this comet is on a hyperbolic trajectory and so will never return to the Sun. It got closest to the Sun in June 2017 at which point it crossed the ecliptic from the northern side to the southern southern side. Observation Info. 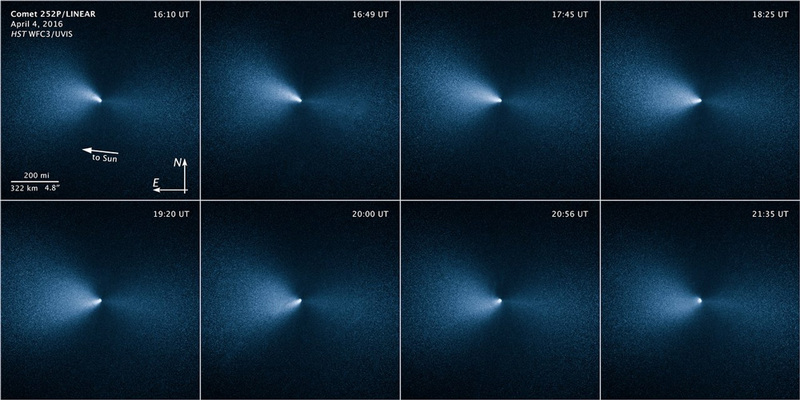 More Comets than ever before! !